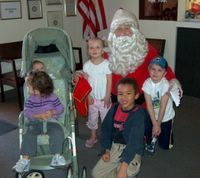 Here are the kids with Santa. Too bad Xayla wouldn’t look at the camera. At least she wasn’t screaming at Santa. She was scared of the Santa at our Ward dinner. cute pict! love to see page’s kids! i can almost see the new one too! yay!